Summary: Difference Between Volatile and Non-Volatile Acids is that Volatile acids are derived from CO2. While Non-volatile acids are produced during the metabolism of other nutritive substances such as proteins. Volatile acids are derived from CO2. 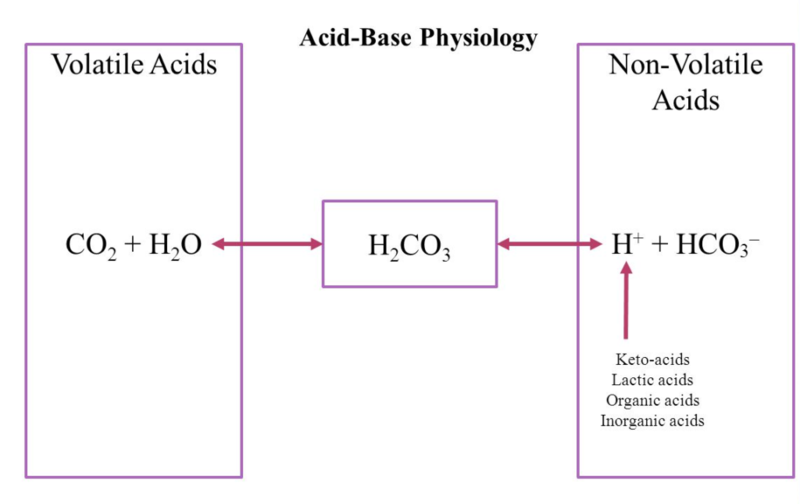 Large quantity of CO2 is produced during the metabolism of carbohydrates and lipids. This CO2 is not a threat because it is almost totally removed through expired air by lungs. Non-volatile acids are produced during the metabolism of other nutritive substances such as proteins. These acids are real threat to the acid-base status of the body. For example, sulfuric acid is produced during the metabolism of sulfur containing amino acids such as cysteine and metheonine; hydrochloric acid is produced during the metabolism of lysine, arginine and histidine. Fortunately, body is provided with the best regulatory mechanisms to prevent the hazards of acid production.